Pave or Micro Pave Ring – Which Your Partner Will Adore? Want to give your heart’s other half an oh-so stylish ring? Well, if you are looking to give your partner an exceptional engagement ring that glitters, pave or micro pave set diamonds can be your best bet. Wearing pave or micro pave engagement ring is one of the ways to steal sights of others. Pave is term from the French word Pave (pah-vey) as in paving a street. It directly refers to the manner of street paving common in early European roads in which cobblestones were arranged intricately to cover up the entire pavement. What are Pave Set Diamonds? A basic pave-set engagement ring features a band that is covered with small diamonds. Pave settings emphasize the appearance of diamonds over metal, thus the band appears to be encrusted by a string of closely-set, shimmering diamonds. Each stone has been set individually so the light is able to reflect off each diamond, giving the piece more sparkle. Pave set engagement rings can range from showy pieces up to sophisticated jewelry that is refined and classic. Mostly common pave engagement ring design features a center stone mounted above, adorned by a singe row of pave-set diamonds. Another popular design features a wider band that is creased with multiple rows of pave-set diamonds and mounted with multiple center stones. Wider bands that require larger diamonds tend to be more expensive. 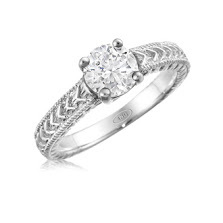 The third style covers several rows of pave-set diamonds lined on a band with no center stone. Pave setting has been around for hundreds of years or even thousands. Though, the setting style or method goes back to the earliest days of jewelry making and is quite ancient, the finished product coming from the hands of jewelry makers can make for some of the most magnificently beautiful and unbelievably intricate designs. Micro Pave is said to be the highly precise setting of very small diamonds using a microscope. Micro pave engagement rings are more detailed in terms of pave-set design. The design is considered by the setting of a large number of the smallest possible diamonds along the band. Micro pave rings are even more delicate and intricate than regular pave settings as the individual stones are so small that they appear to blend together and create extraordinary fire. And since the diamonds are smaller than a traditional pave setting, the surface is much smoother and less likely to rub against other fingers. Micro pave engagement rings are a great choice if you are looking for a sparkling engagement ring with a more complex band design. Both pave and micro pave utilize small diamonds called “melee”, to coat entire sections of jewelry, most often rings. The cost of pave and micro pave engagement rings can be vary depending on the design you want, Though smaller stones are less expensive with larger ones, the sophistication of the design is defined to craft and may add up the cost of the ring. Mike Nekta is a jewelry expert in New York who has created numerous beautifully detailed diamond engagement rings, wedding bands out of the New York City Diamond District. Mike Nekta created custom rings for clients Nationwide, as well as Internationally and Micro pave are his specialty. Micro Pavé technique allows Mike Nekta to set very small diamonds really close to each other and this creates an effect that shows less metal and more of a Diamond presence in the ring. Other local jeweler probably has no clue about micro pave or the instruments used to make these types of rings. And Mike Nekta is really different. He’s not just a traditional jeweler. He is an expert with a specialty of custom engagement rings created exclusively for each client. For professional service and great selection of jewelry, call or visit Mike Nekta for a FREE 20 minute diamond consultation. Take a look on some of examples of his pave and micro pave unique designs only at http://mikenekta.com/. Get connected with him at (917) 570-3112. With paves you can have a stunning, lavish looking ring that is stylish and chic that for sure your partner will adore. See and be proud to the lovely creation on hand you gave to your partner that you that will be envy of many.